Broken service agreements or breach of contract can happen for any number of reasons, and the agreement can be broken by either service provider or customer. There may be serious consequences if a breach of contract occurs by either of the parties involved in the agreement. Service contracts can encompass any number of agreements between a provider and a customer. It can be as simple as a taxi firm that provides staff taxis every day to an energy company that provides fuel for huge companies. The offer will be made from the company to provide a service to a customer, and if the offer and the terms of the offer are agreeable then the contract will be set in place. In a service agreement their will be many terms and conditions. These terms do not have to be in writing, although it would be wise to do so, but they can also be made verbally. Once all of the terms and conditions have been made and agreed upon the service agreement is then legally binding. 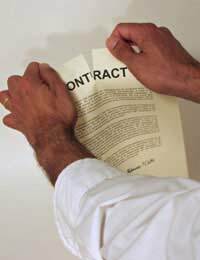 Breach of contract will be one of the terms and conditions mentioned within a contract. The seriousness of the breach will usually depend on the scale of the service provided. For instance, a business that is being supplied a service that is integral to the business’s smooth running and productivity could suffer serious financial damages if the intended service did not happen. If a service supplies products to a business that are needed to keep the business running, and time scales and deadlines are involved then the business can suffer if these products are not delivered as promised. If it were the case that the original service agreement was breached in this way then the business customer could have grounds to sue the service provider for financial loss. There are many reasons why broken service agreements can occur. A customer failing to pay their bill on time would constitute a breach of contract. Builders that substitute their own materials for agreed materials could be seen as breaching the terms and conditions of an agreement. Suppliers that promise to make deliveries within a time scale but fail to do so can be seen to be in breach of contract. The seriousness of the breach and the action required will come down to how much loss occurs either financially or in terms of hardship and trouble for the innocent party. Consumers have a great many rights when it comes to dealing with businesses and service providers. Consumer rights were set in place to protect consumers against any unfair business practices. Customers have a right to expect services to be as they are were advertised by the provider, and as were agreed by the terms and conditions of the service contract. If a customer does have a dispute with a service provider then the first point of call should to be deal with the situation amicably with the provider. If this method fails then the customer should contact the relevant body that regulates the type of service that is being provided. Information on the various types of governing agencies can be found from either government offices or local Citizen’s Advice offices. If legal action is required over any broken service agreements then the contract will be used as a point of reference. A judge will need to determine the full extent of the breach by looking at the terms and conditions of the contract. Even if the service agreement is a verbal one the case can still be brought to a court of law. If there are no actual written terms and conditions then judge will look at the service in practice. Damages can be awarded to the innocent party by the court and they will be paid by the service provider. There may be other consequences when a provider breaks a service agreement other than financial damages. Loss of good customer faith and loss of business reputation may be harder to replace than the actual financial damages. Broken service agreements can be very taken seriously in consumer law and there are many regulatory bodies that are specifically designed to protect the customer. Advice should be taken before proceeding with any legal action between a customer and a service provider if a dispute does occur. I am a Talktalk Telecoms plc customer who have had their personal information stolen in the October 2015 data hack. This is in direct contravention of TalkTalk's own Terms & Conditions, the Data Protection Act, European Directives and their implicit Duty of Care to me as a customer. as a result of this data breach I have been inundated with telephone calls from scammers and my email address has been accessed and attempts been made to change passwords to websites. Do I have a case to bring them to account in the small claims court. I am also wondering why no class or group action has been taken on behalf of the 150,000 customers whose information has been leaked and made available to criminal groups. Why is the consumer treated with contempt in this country. You would have to seek legal advice if you are not happy with the compensation Talk Talk has offered, in order to see what the best course of action would be. Please see link: TalkTalk cyber-attack - know your rights here. My daughter was 'asked to leave' her dance group days after we had returned from performing at Disneyland Paris. The reason she was told to leave was because my husband took offense to an email sent by the dance teacher's husband which contained vague threats about being removed from class if any more 'undesirable actions' by parents continued ie talking to each other about the cost of costumes, setting up a facebook group just for the parents. When my husband sent an email response to the dance teacher's husband saying how he felt about the vague threats in the email we received a response which basically was summed up in the last 2 lines: forward me your bank details and I will refund you the costs of the dance classes you have paid for, there is no need for your daughter to attend class tonight!!! Following that we have emailed, texted and phoned trying to speak to them about their totally irrational reaction to the email and we have had no further contact at all. I have been advised by consumer affairs to make a Breach of Contract form/letter and send it to the dance teacher as (by my calculations) we have spent nearly £500 on costumes & props alone this year, many of which haven't been worn/used at all. I want this money back but I don't know know where to get the correct form to complete or how to do this properly? I don't have the money to afford a lawyer and I did a lot of additional shifts at work to afford these costumes & props. My daughter is only 7! !